Eject your kids from bed. From Anywhere. Anytime. So of course I picked it up and brought it home. Since we have a hard time getting our youngest out of bed in the morning, I made sense to try and hook it up to his bed. The first order of business was to understand how the bed’s controller works. We first thought that the controller used PWM so we hooked up our Oscilloscope to the two metal wires that travel from the controller to the bed’s screw drive. We moved the controller up and down but no signal was being recorded. Sonoma then noticed that the “wire” was a hollow tube. Taking a wild guess, we blew down the pipe. Sure enough, that made the bed move. So now we had to figure out how the controller moved air up and down the pipe. We opened the controller and there is a small bellow that attaches to the pipe. Press the controller on 1 side and air is forced down the pipe, press the controller on the other side and air is sucked up the pipe. So we batted around ideas about how to push air up and down the pipe – ideas included using a small electric air compressor, some kind of mechanical pressure plate, etc… We then decided to try and gluing a servo to the switch and controlling the movement that way. However, we couldn’t figure how to attach the servo to the existing plastic switch. So we decided to build our own switch – we used my son’s erector set to create the harness for the bellows. With the switch now hooked up, we had a way of controlling the bed. We then took the screw drive off of the hospital bed and attached it to the frame of my son’s bed. We then attached some hinges from the box spring to the base and the bed pushes up about 45 degrees. Now that we have the mechanical pieces worked out, we needed to tackle the electronics and coding -> basically from the servo on out. The first thing we did was take the Raspberry Pi and hook it up to our home network. Because the bed is not near any ethernet port, we took an old Asus Portable Wireless Router, configured it to be an Access Point, and plugged it into the Raspberry Pi’s ethernet port. To stand in as the servo, we followed the Windows IoT’s team code sample for the Blinky project and hooked up a light. With all of the hardware plugged in, I headed over to Windows On Devices and followed the instructions on how to set up a Raspberry PI. After installing the correct software on my developer workstation, flashing the SD card with win10, plugging the SD card into the PI, turning the PI on, and then remoting into the PI via powershell, I could see the PI on my local workstation via the Windows IoT Core Watcher and the PI showing its friendly welcome screen via HDMI. I then headed over to Visual Studio and copy/pasted the “Blinky” project to the Pi and watched the light go on and off. And now when I Tweet, the PI reacts. Since Twitter does not allow the same Tweet to be sent again, I deleted it every time I wanted to send a new message to the queue. 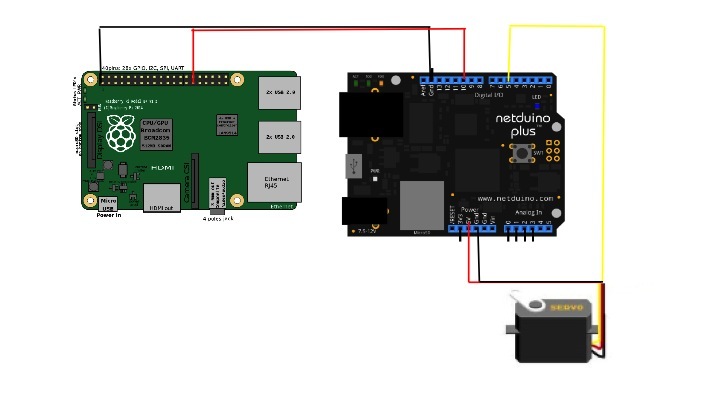 So the Netduino code gets deployed to the Netduino and I can use that light class on the PI to tell the Netduino to move. Now I have the ability to control the servo from the PI. I would have rather cut out the Netduino completely, but the limitations of Win10 on Raspberry Pi won’t allow me to do that. All of the code is available on GitHub here.